Welcome to another great MAUI FOOTPRINTS property (Kaleialoha 409). Location, location, location! 20 feet to the ocean, no walking around buildings, no busy streets to cross...you are staying right on the ocean. 5 minutes south to the world-famous Ka'anapali Beach and Ka'anapali Golf Course, walking distance to Honokowai shopping center and fun farmers market, and 10 minutes north to Kapalua resorts. This suite offers an amazing 180-degree view from the wide 147 sq. ft. lanai. 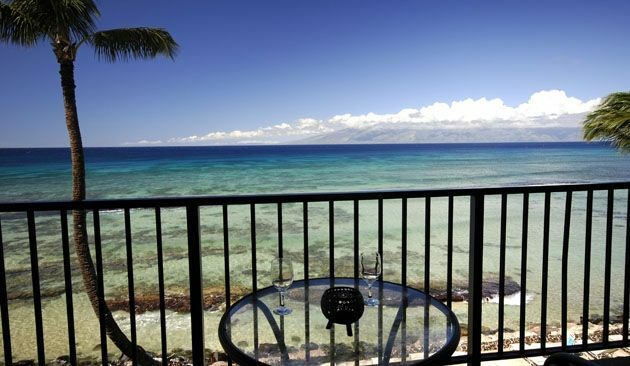 We have a magnificent view of both neighbor islands, Molokai and Lanai, and comfortable patio furniture to relax and enjoy your meals or a glass of wine in the best seat on the island. Words cannot describe what it is like watching breathtaking sunsets from your condo right on the beautiful West Maui OCEAN EDGE. During the year, the sunsets move back and forth between the islands of LANAI and MOLOKAI. You have the perfect combination of the best privacy, stunning views and soothing ocean sounds on the famous West Maui coast. WHALES! WHALES! WHALES! During the season, watch the Humpback Whale shows right from your large lanai as the adult whales teach their babies how to jump and play. No need to even go on a boat to whale watch. This condo has been popular for many years and has many happy, returning annual guests. We have upgraded all of the windows and doors, updated the kitchen and and floors, and installed a new air conditioner. Annual guests will find that the condo now is even better than before. For your added convenience, our unit also has a washer and dryer and Wifi Internet connectivity is complimentary in this suite. Only four stories high, our property is relatively quiet being set away from all the high-rise resorts and condominiums. Enjoy the advantage of being on the top floor; nothing is between you and the OCEAN. Besides being 5 minutes away from world-famous beaches, we also have our own small, sandy beach cove that is just to the left of the BBQ area. There is a nice sandy entrance into the water, and you will usually find the current in this area quite calm for easy swimming. Enjoy the private snorkeling area right in front of your condo. Explore the incredibly clear waters of the Pacific Ocean where colorful TROPICAL FISH AND SEA TURTLES play! Be sure to enjoy all the wonderful restaurants in the nearby area, or you may just want a nice relaxing dinner at home. You can BBQ on the OCEAN FRONT and listen to the soothing waves. The best seat on the island for dinner is on your LANAI enjoying the SUNSET! NOTE: This unit is cleaned just prior to your arrival and then again after your departure. There is not interim daily maid service. The Hawaiian GET License # is: W43740339-01. This is Julia & Jack's place. The views! They are amazing! Best on island. Brand new knife set, and cooking pans. We stayed here for about two weeks. The condo was nice. The area is a mix of condos and apartment complexes but you can walk to shops, restaurants, and a beach park which has a playground in case you've got little ones. The area was a bit busy for us and that is my sole regret. The lanai is awesome. The wife wanted to see whales and we saw them. Every day. From the lanai. Turtles too. Although the beach at the condo may be good other times of the year, in February it was not. The neighbors were mostly older folks and were really friendly. The grounds are kept nice and clean. The walls apparently work well on keeping sounds isolated as we travelled with a toddler and as we were leaving the neighbor said he didn't even know we were there. The pool was great and there is an area for sunbathing and barbecuing. I just wrote out a super long review and accidentally deleted it, so all I’m going to say is....this condo is AMAZING, the view is incredible, can’t be beat. The building and grounds and very well kept and all the other occupants and vacationers were very friendly. The Lanai is seriously heaven on earth and it was so hard for me to do anything but sit there and watch the whales. Snorkel and beach gear is provided for you, no need to buy or rent while you’re there! All you have to do is walk down the staircase and into the water. There actual beaches within walking distance if you prefer that but my hubby and I mostly just went snorkeling and swimming right behind the condo! Becky was very quick to respond and very helpful. We were there for our honeymoon and it couldn’t have been more perfect! Book this place now, don’t even bother looking elsewhere. Mahola! Wonderful place in a great location. Upgraded counter tops and appliances. The view on the Liani is what it is all about. And you do see turtles swimming. Second time here and will definitely be back! Great view and saw turtles every morning and evening while on the lanai. We also saw whales breaching which was a bonus! We shared the condo with another couple and we had the hide-a-bed which was surprisingly not bad (we sleep on a king size serta memory foam at home). Great location to Lahaina as well as places to eat within walking distance. The beach next to condo unfortunately had a lot of high tides which was different than when I stayed back in 2012, however there is a beach down the road (walking distance). They do have lawn chairs to lay out on if you want to skip the sand and you can access the ocean from the condo. Will definitely be back! The closest big beach is 'Airport' beach. As you head south toward Lahaina on the upper road (the one toward the mountain) it will be your first right past the cane fields. There is a traffic light and it is across from the Sugar Train depot. Turn in. There are bathrooms and a nice big parking lot. One downside, it can be windy here. The next closest beach is at Whalers Village. This is in Ka'anapali proper. Turn right at the Ka'anapali traffic light (just before the golf bridge over the road) and follow the road around to Whalers Village on the left. Park in the lot ( see parking section about passes). Walk through the shopping area to the beach, just past the Hula Grill. Golf: There are plenty of golf courses on Maui. Kapalua (3 courses) , Ka'anapali (2 courses) , Wailea (3 courses) to name a few resort courses. You can call them for fees and tee times. A good public course is Sandalwood in Waikapu (the other side of the West Maui Mountains) . Another is The Dunes at Maui Lani 873 0422. The Dunes is a links style of course and can be tough, but still a lot of fun. If you didn't bring your clubs, do NOT rent at the courses. I made that mistake once to the tune of $50 for the day. West Maui Sports and Fishing Supply on Front Street in Lahaina has very reasonable day and weekly rentals.